Some of my new friends are playing hacky sack in parking lot. I am sitting nearby with my feet dangling in the pool, wearing a cotton dress that I just bargained for in the local market. I am covered in sunscreen, bug spray and sweat. It’s cooling off as the sun sets. It’s now in the high 20s. In a few hours, we’re going to get on our second night train. I’ve had absolutely nothing to do for the past 6 hours. I whittled it away eating fruit and street food, walking and chatting with fellow travellers. It only took a week, but chilled out backpacker status is slowly settling in. I was not as relaxed the first few days. I landed in Hanoi after 24 hours of travel. Sleepy brain. No idea where to get coffee. Money I don’t understand. Food I don’t recognise. Victoria is so cold, quiet and empty. 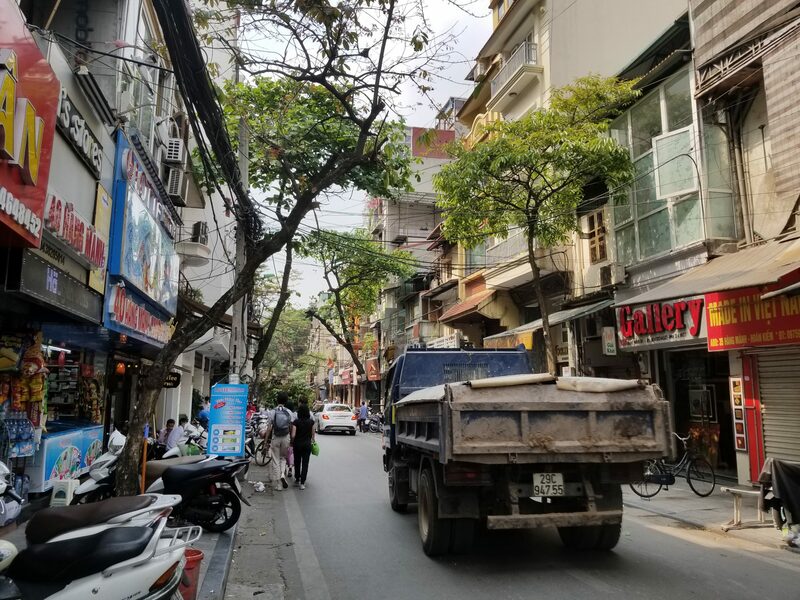 Hanoi is shockingly warm. Full of motor bikes. Lots of tiny stores. People sitting on tiny stools on the street eating bowls of food. I tried to be brave. But it was hard. Just walking around to find an ATM and lunch took almost all day. So many new experiences. Having to be fully responsible for myself. I kept thinking of all the work that has gone into making this trip happen. Saving money. Negotiating time off. Making plans and having them fall through. Starting all over again. Was all this worth it? Just so I could drink a fruit smoothie at a tourist spot by myself? A wise woman once told me that it’s fine to wallow in self-pity whenever you want. But for only twenty minutes at a time. So I went I decided to go back to my hotel and have a little cry. Money could have solved this problem. As a tourist on a short vacation, you can fill every single day with tours and activities. Being gone for 4 months by yourself is something else. I’ve saved a lot of money, but I need to be careful to make it all last. It’s forcing me to be content doing very little. I am spending most of my time walking around. Looking out the window. Writing. Talking to people. Eating. Playing cards. I’m relaxing into this new existence of endless days. And I’m not just eating fruit smoothies anymore. I think long trips (not that I have had many!!) are about immersing yourself in the culture, learning how others live and view the world and making connections with people. I am sure you will find your pace as you travel and come back a richer person for having experienced how some of the rest of the world lives. Enjoy the journey and let yourself be open to whatever comes your way…..with a caveat…..use your common sense and be cautious too! Most people in the world are trustworthy, honest and sincere but you still have to be aware of the few bad apples. Thinking of you and praying for you….and hoping you have an amazing time!! I am finding that too, that most people are so nice and helpful! It’s a relief because so much you read about travel is focused on the negative stuff and scams. Looking forward to following your solo adventure.